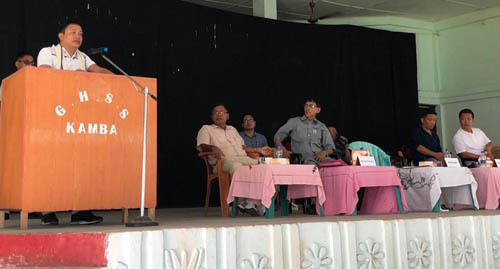 In an effort to facilitate parental participation in the school, a Mother-Teacher Association (MTA) and a Parent-Teacher Association (PTA) was recently formed at the Government Higher Secondary School (GHSS), Kamba in West Siang district in Arunachal Pradesh. The PTA, which is a school-based organization of parents and staff, would work on a mission of making the school a better place for the children to learn while the MTA would particularly focus on the needs and development of girl students. Formed under the supervision of Liromoba legislator Nyamar Karbak and GHSS, Kamba principal Gekir Karga, members of both the associations would also work together and support the school management committee (SMC) in all its efforts related to the overall development of the institution and its children. Addressing a gathering of parents, school staff and students on the occasion, MLA Karbak called upon the members of the PTA and MTA to sit for regular meetings to review the performance of their children and school. “Students perform better at schools where the parents are involved. The visible presence of parents and guardians around the school would also make the institution safe and more orderly,” said Karbak. While asserting that the success ratio of students passing the APPSC examinations is more of government schools than that of private institutions, the MLA called for concentrated efforts from all ends to make GHSS, Kamba a better and successful school in this regard. Addressing the members of MTA in particular, Karbak asked them to look into all the needs (including sanitary necessities) of a girl child. School principal Gekir Karga, MTA chairman Yormi Kato, PTA chairman Mokar Nomuk, ADC in-charge Tamas Mugli, ex-PRI Damli Niri and advocate Geli Noshi also spoke on the occasion. The meeting was followed by the inauguration of a smart classroom by the MLA after which he announced to sanction funds to the tune of Rs 10 lakh to upgrade the classroom.